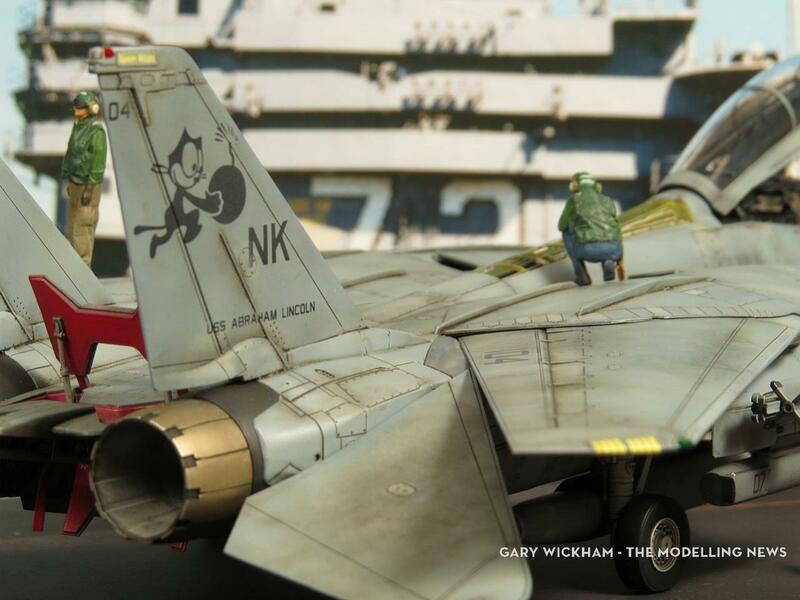 We have been teased long enough! 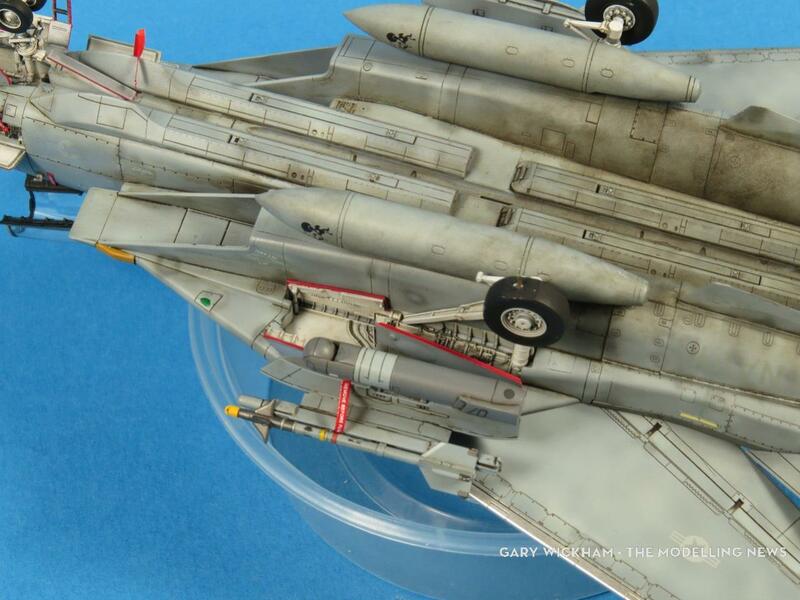 Before we get to the “how-too” (soon to come)…Gary’s finished build of the Finemolds F-14D Tomcat in 72nd scale is complete. 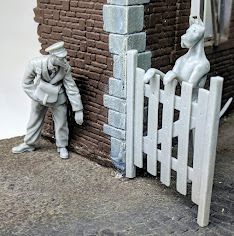 Today we’ll show the kit finished with lots of extras on a very nice looking deck section cluttered with lots of figures to populate the story. 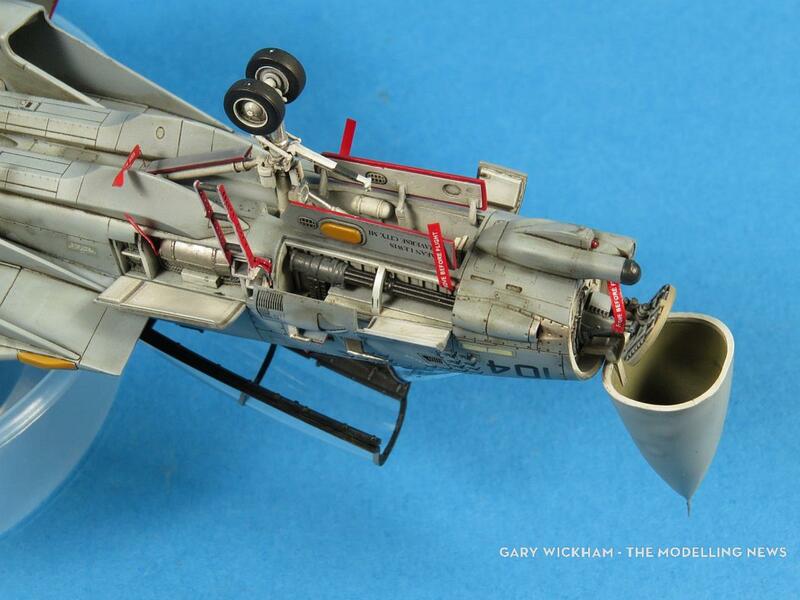 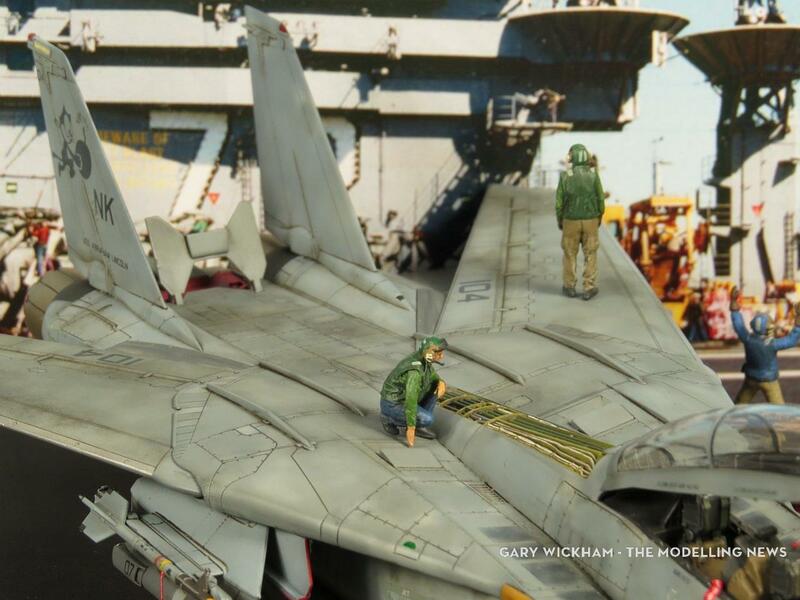 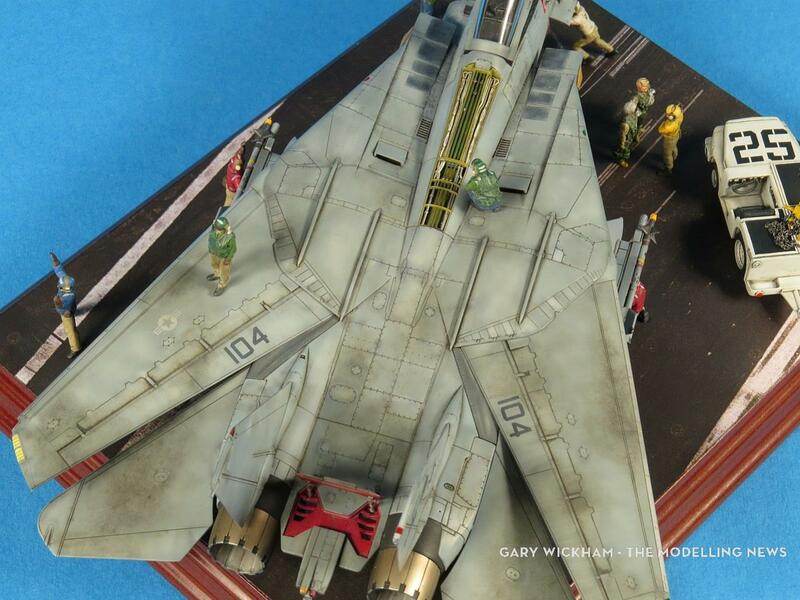 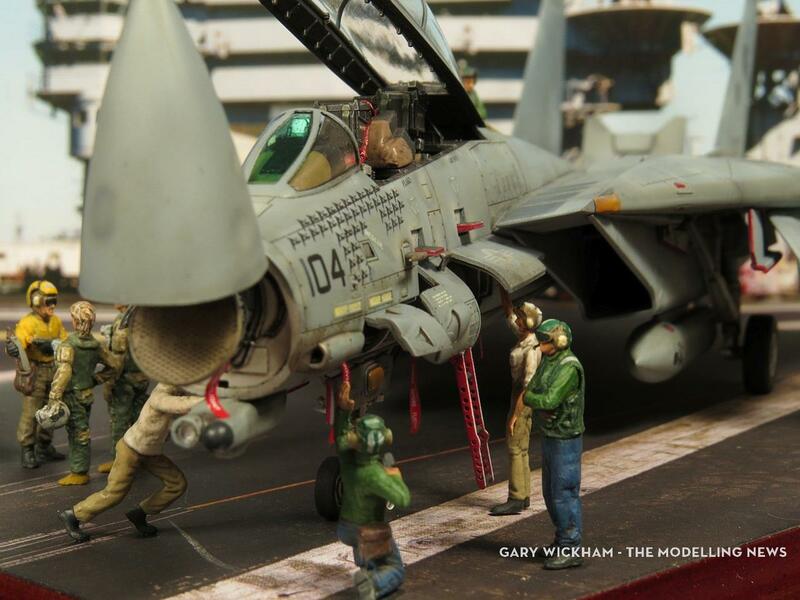 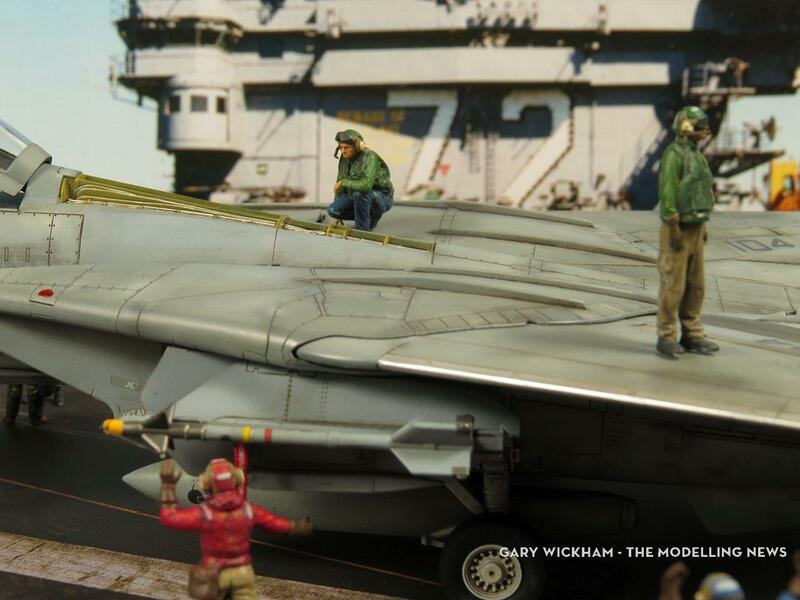 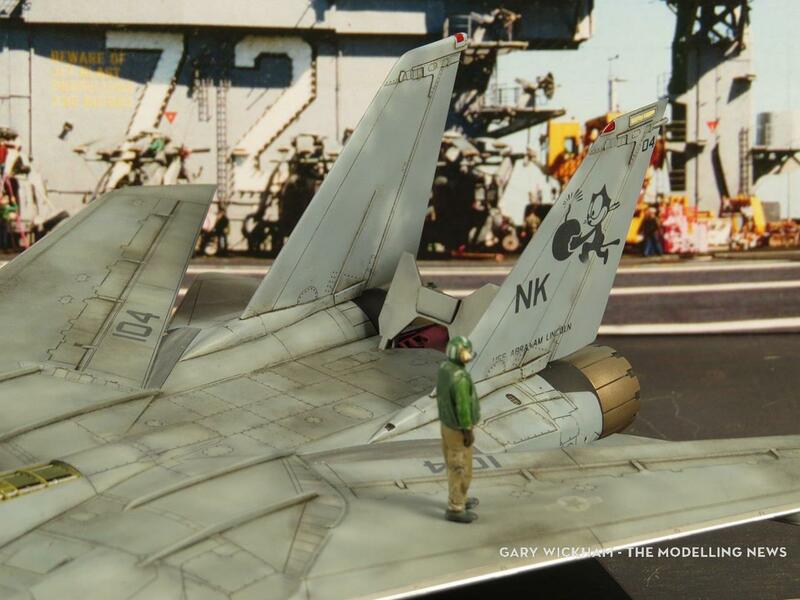 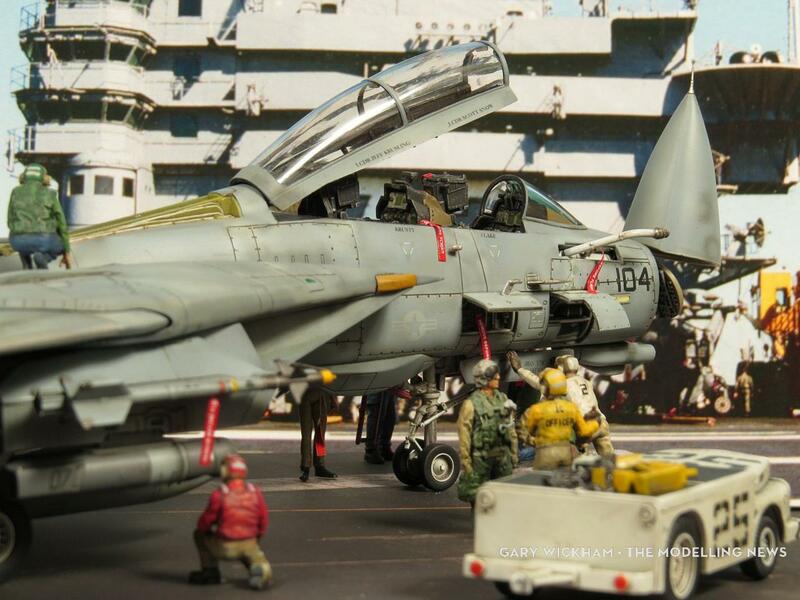 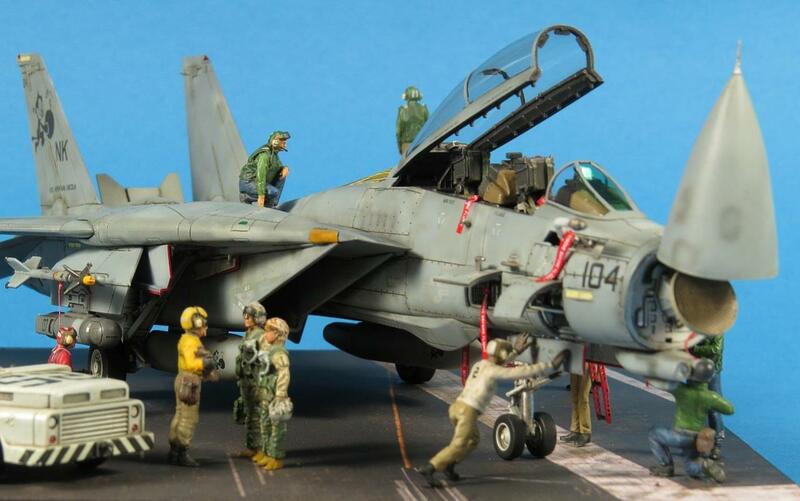 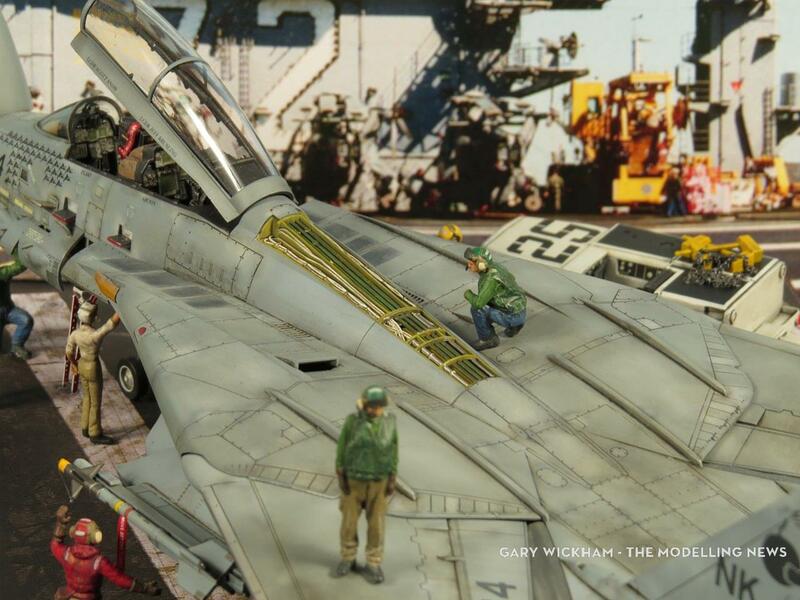 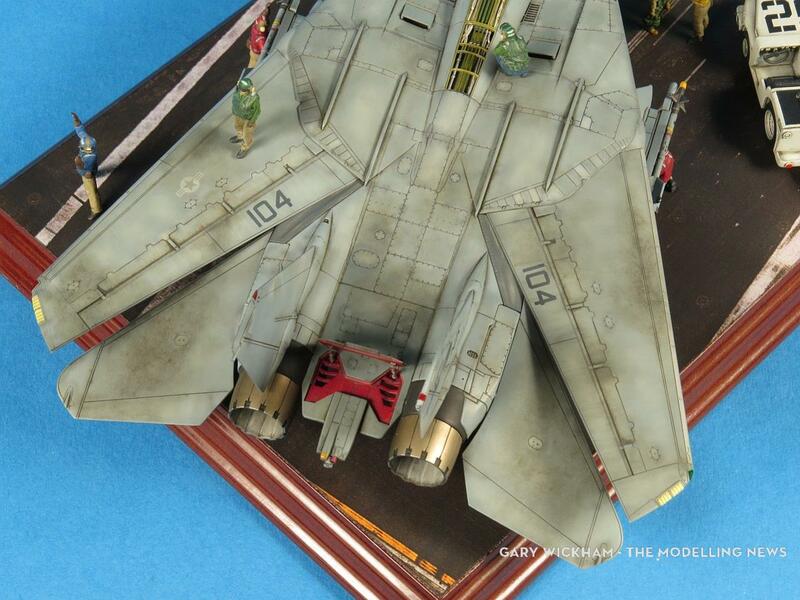 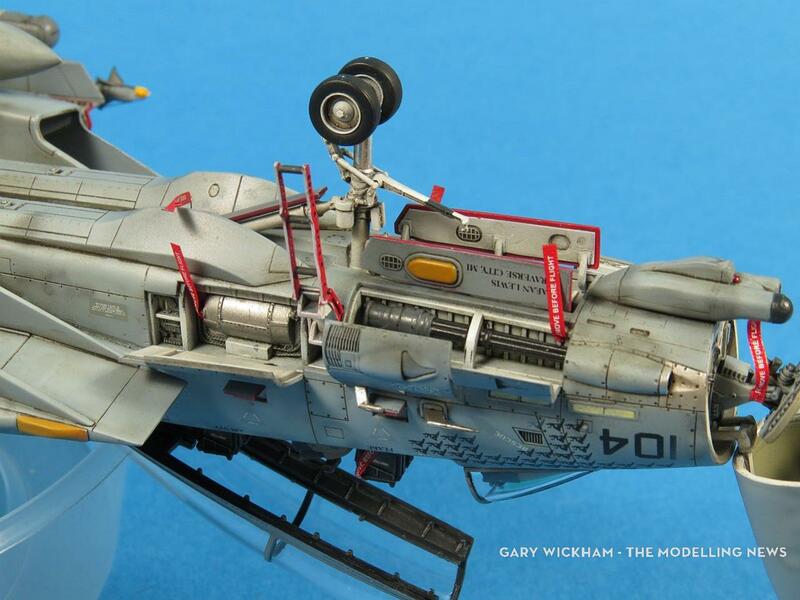 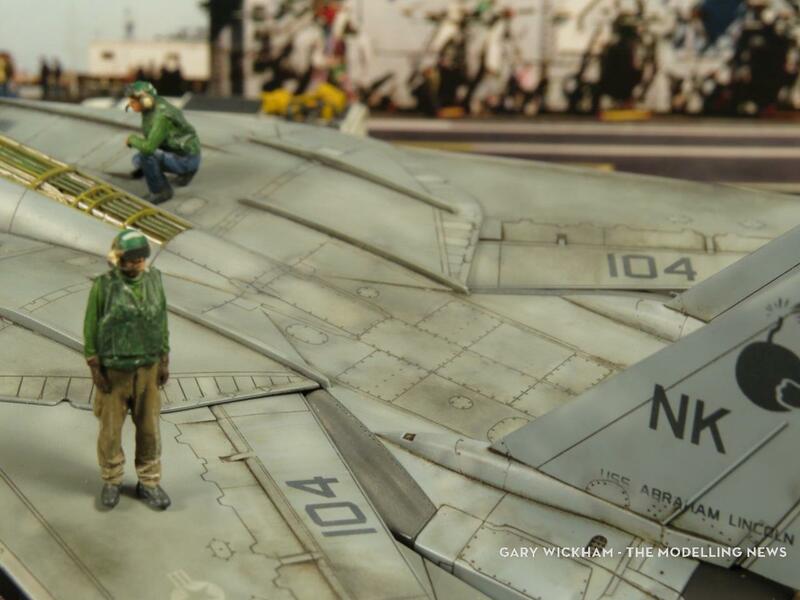 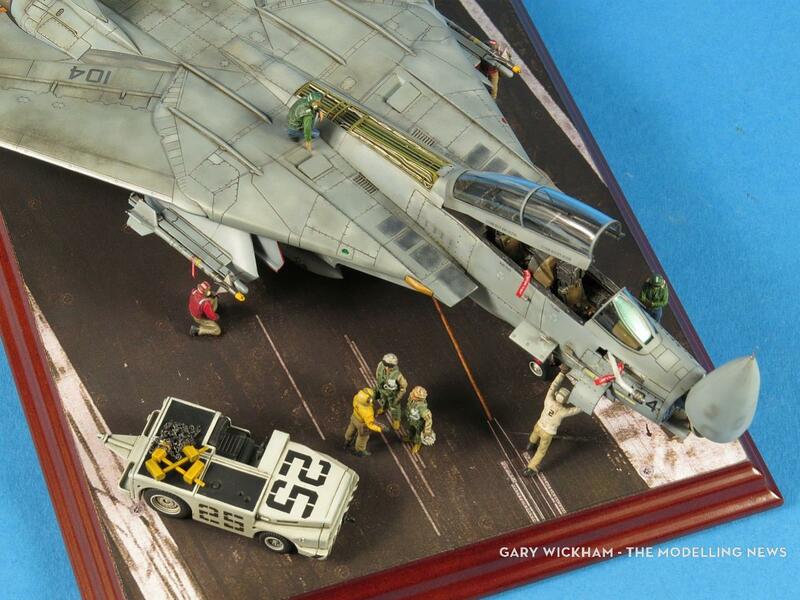 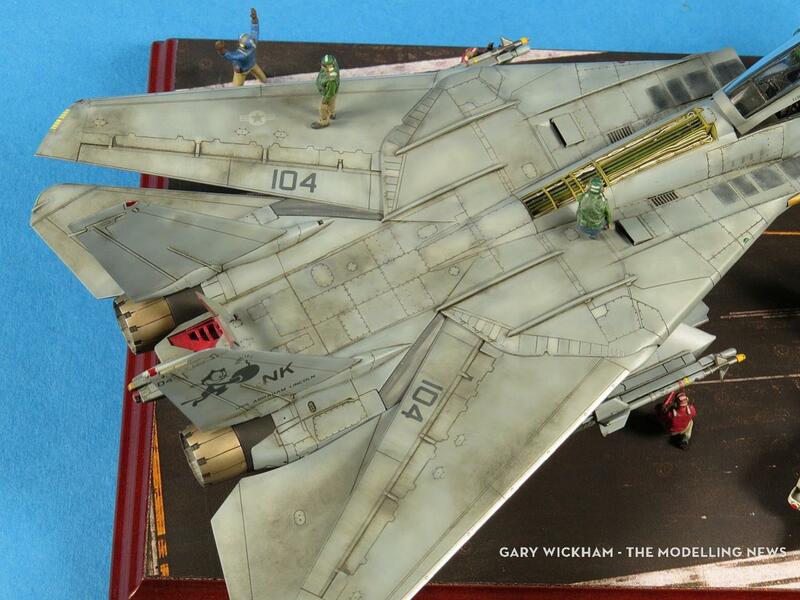 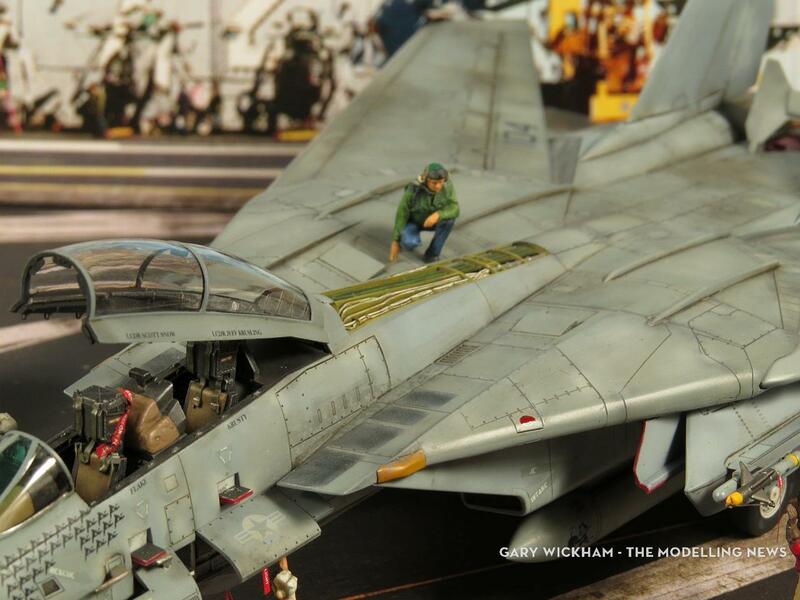 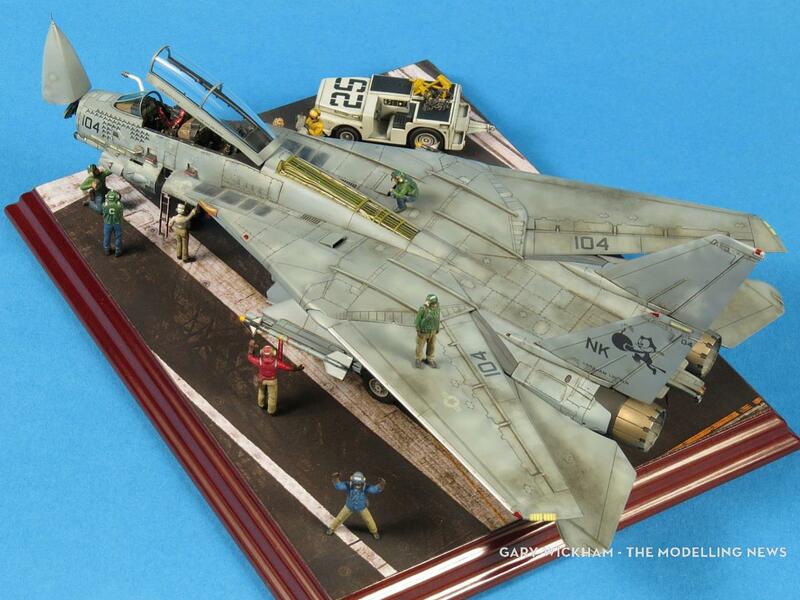 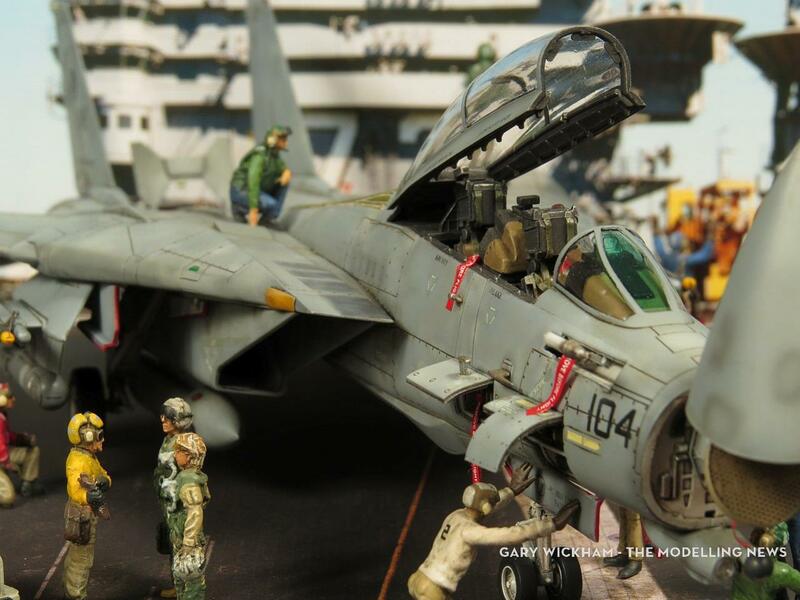 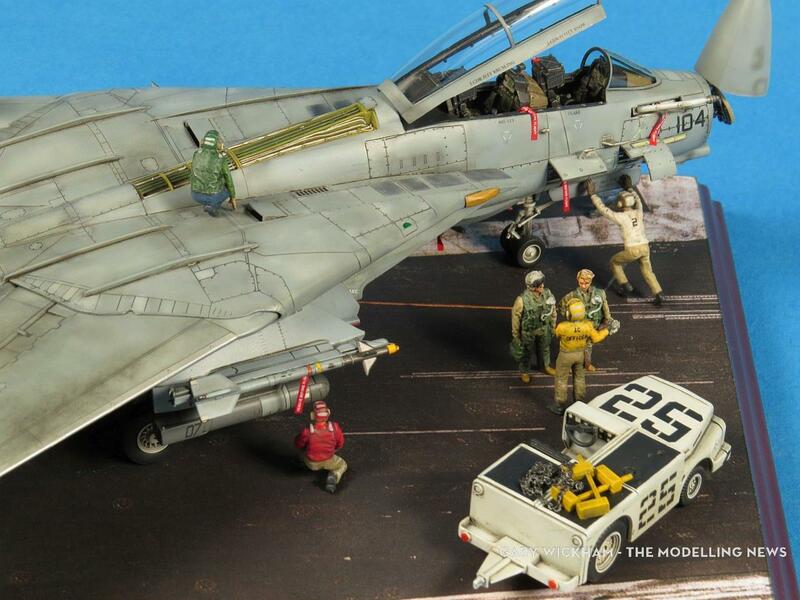 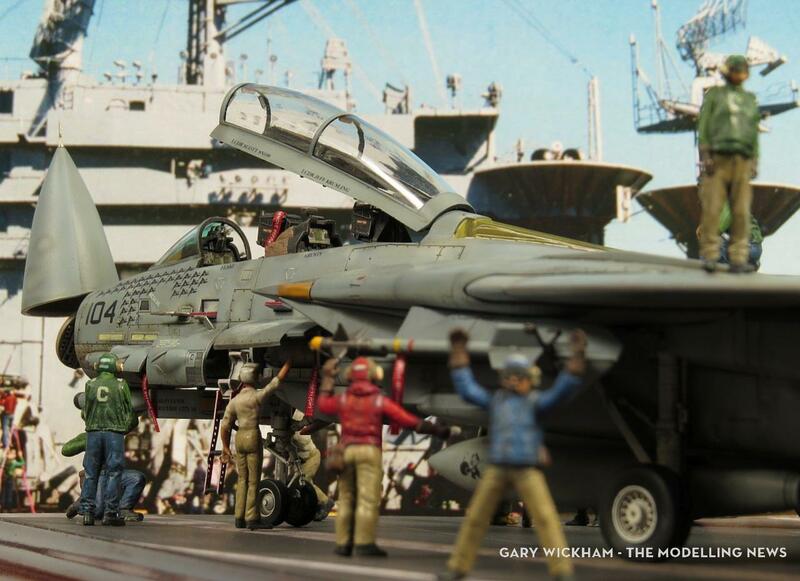 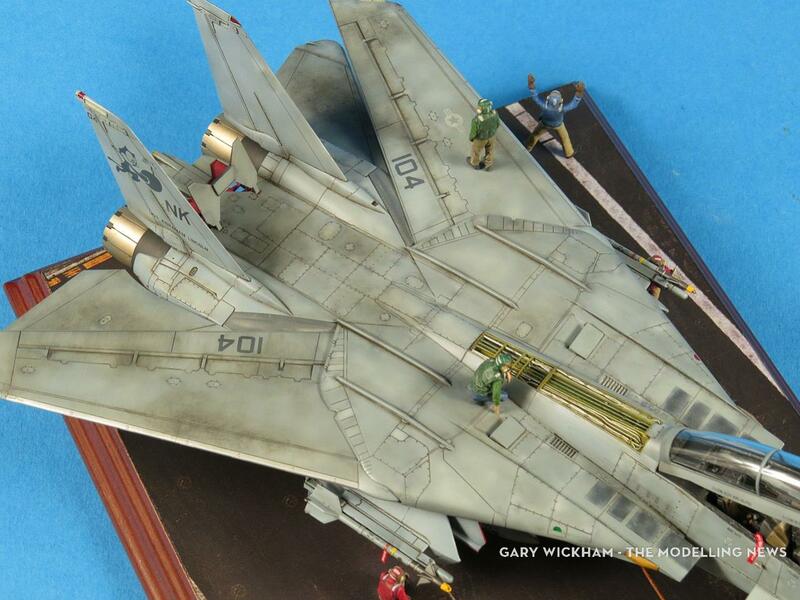 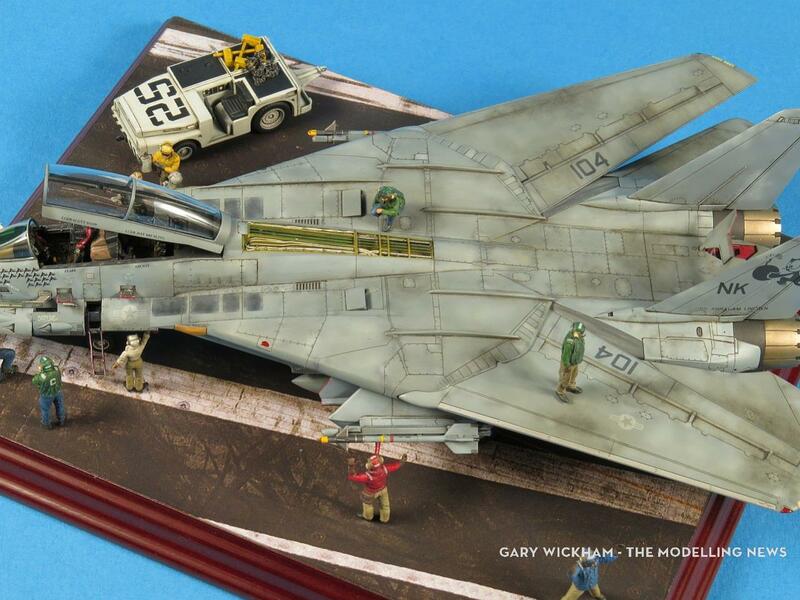 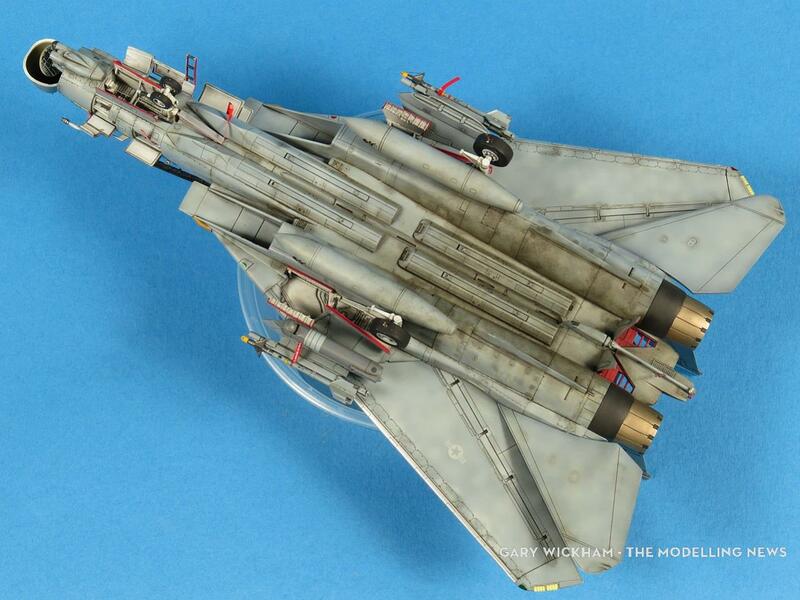 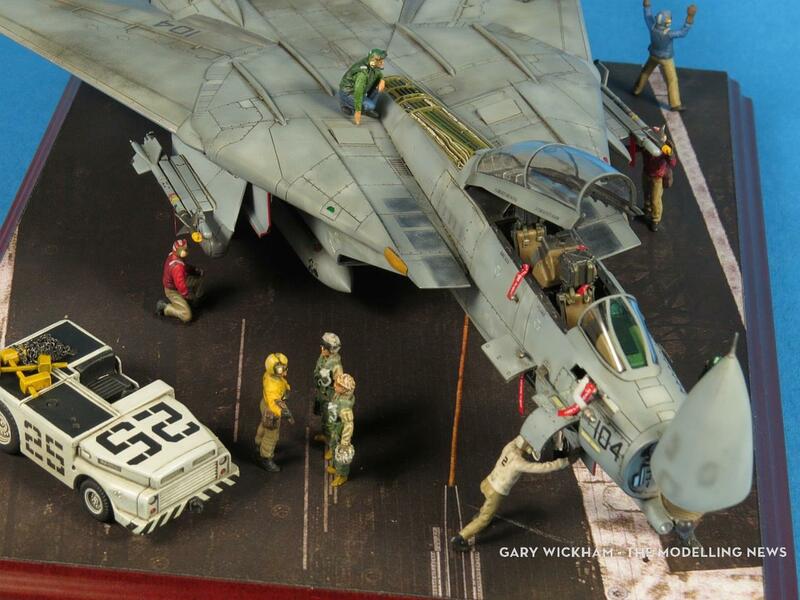 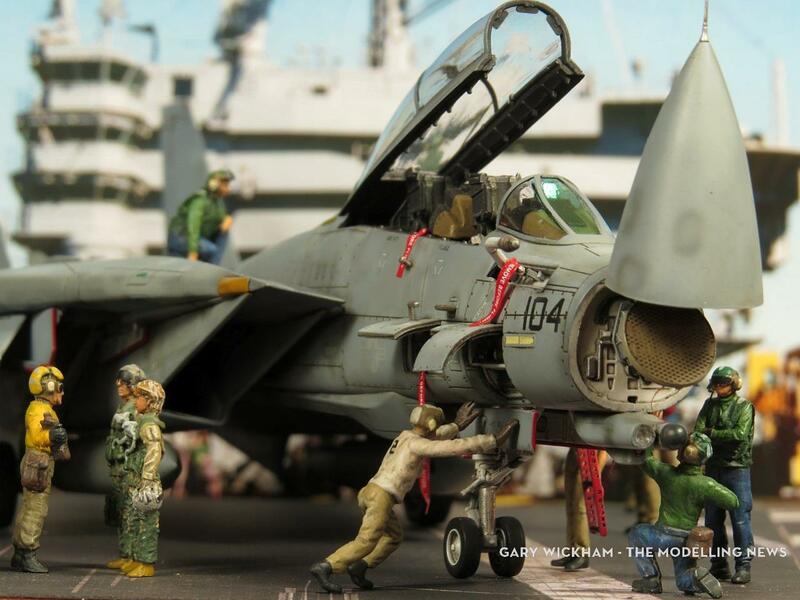 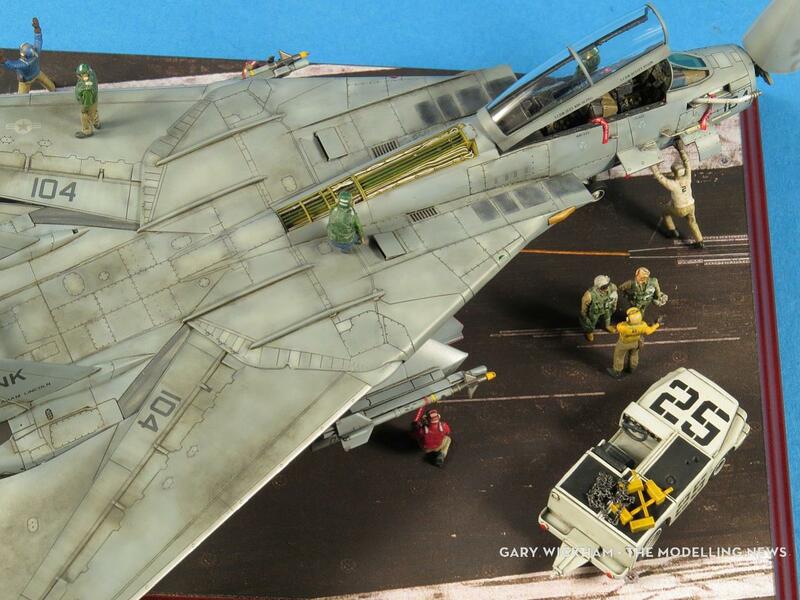 Gary Wickham’s Grumman F-14D Tomcat (FineMolds 1/72) build – finished gallery. 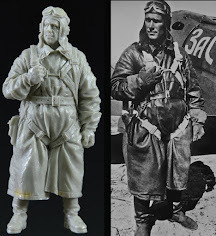 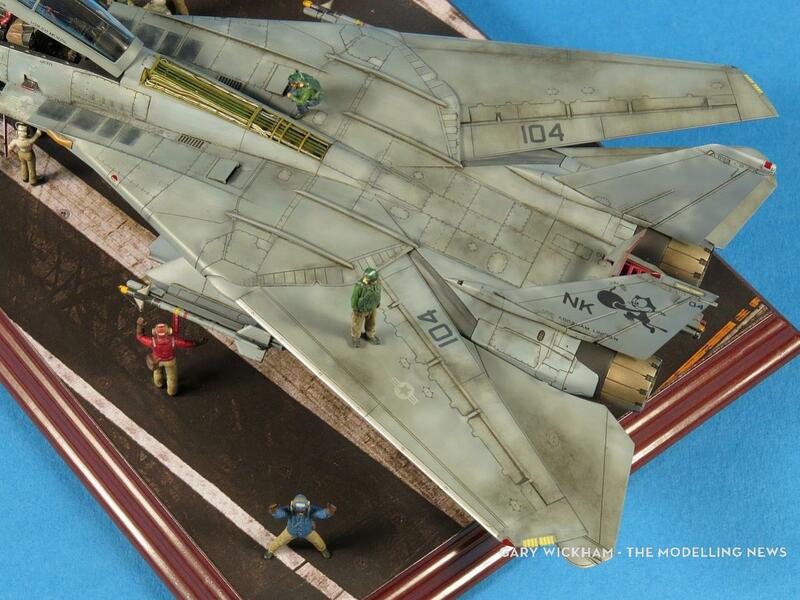 FineMolds recently released their brand new tooled F-14D Tomcat in 1:72. 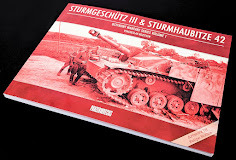 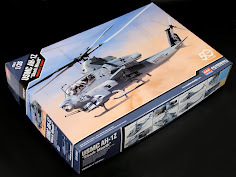 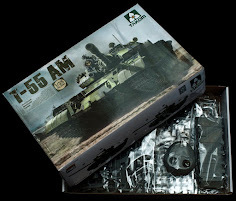 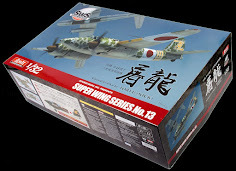 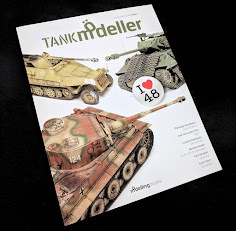 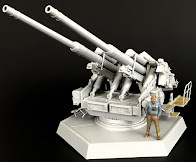 The kit sprues can only be purchased in conjunction with the Japanese monthly magazine, ModelGraphix via Hobby Link Japan. 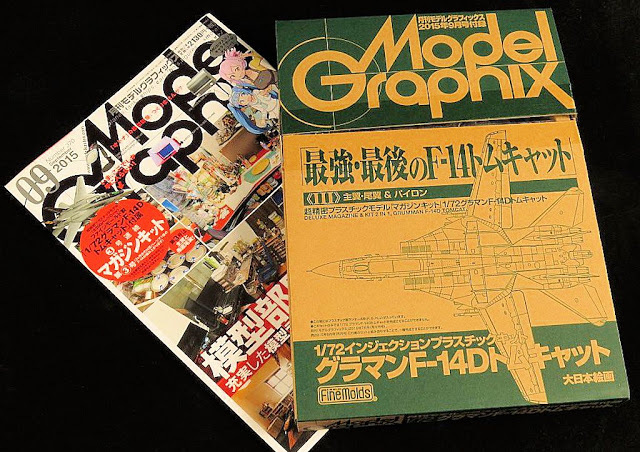 In all you need three issues of the magazine (plus one other for the weapons) to get the whole kit. 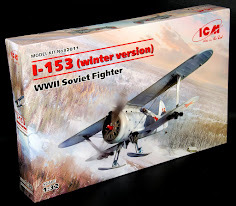 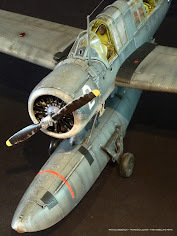 The model is simply stunning with options out of the box to open the radome, avionics and gun bays, refuelling probe, fuselage spine and rear air brakes. 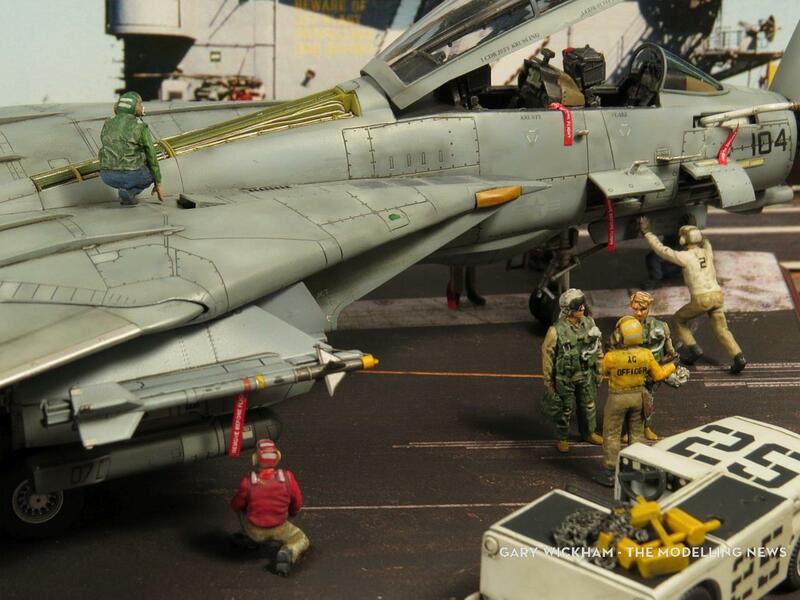 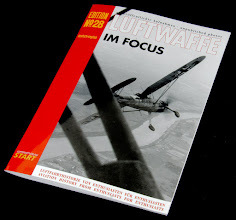 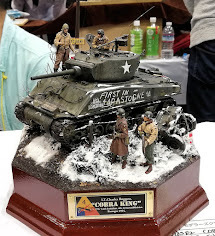 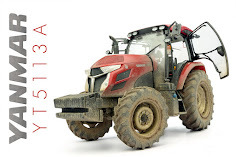 The detail that FineMolds has packed into 1:72 puts many 1:48 and even some 1:32 kits to shame. 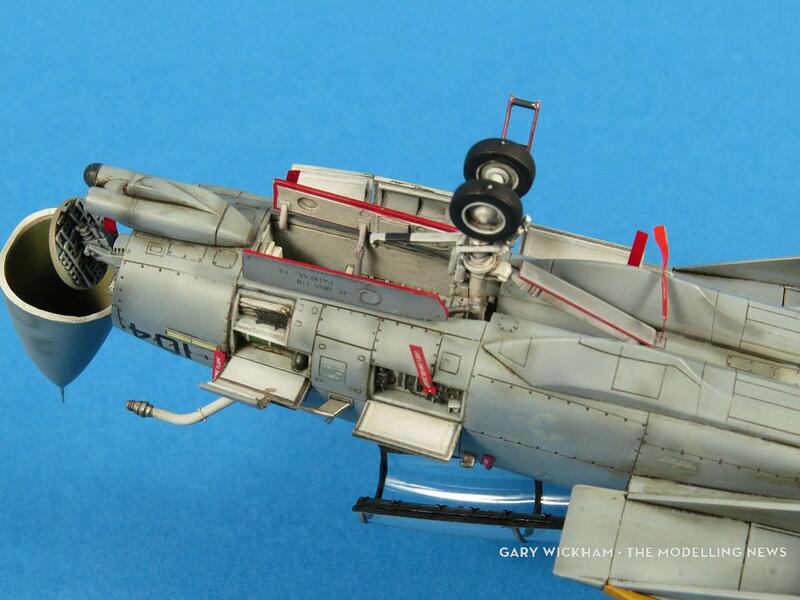 The fit and engineering is superb and the model almost builds itself (yes, it really is that good). 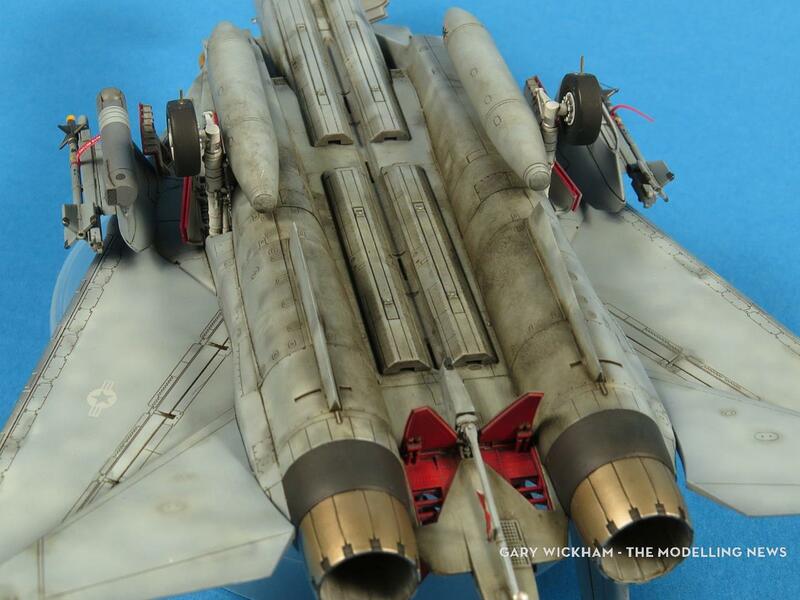 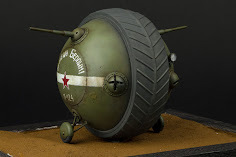 I finished my model with Gunze Mr Color and Alclad paints and tried out some of the new MiG Ammo panel washes for weathering (these also performed very well). 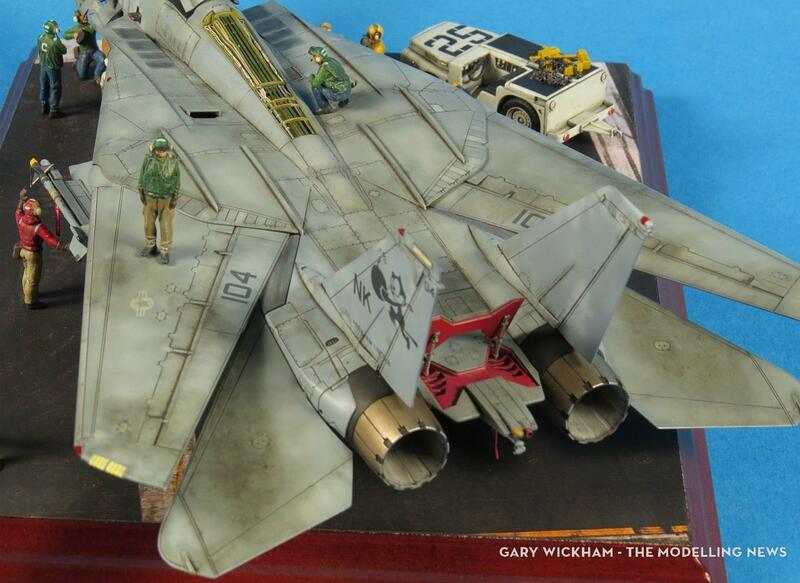 I wanted to model a lo viz TPS scheme F-14D and already had a set of the excellent Twobobs 72-026 VF-31 Tomcatters "Felix in the Fight" decals depicting OIF (Operation Iraqi Freedom) Tomcats. 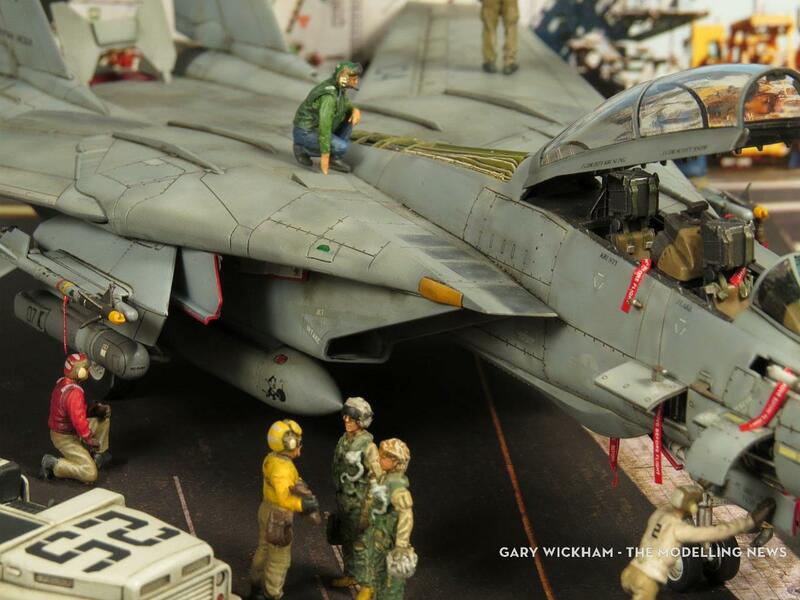 A view of the top of the kit and dio showing all the crew hard at work. 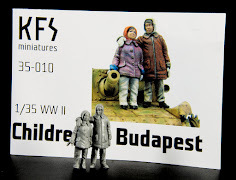 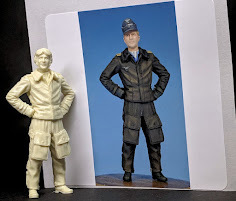 The deck drew and pilot figures are from ModelKasten, ReedOak (excellent 3D printed), Fujumi and Verlinden and they are all sitting on top of a pre-printed base by Ushi Van Der Rosten.